ISIS has been on the back burner since the media decided to go after Trump 27/7, but that doesn’t mean that the scumbags are gone. There is now a propaganda video that has the alleged 10 year-old son of an American soldier making threats on Donald Trump’s life. The boy’s father is rumored to have fought in Iraq and makes the threat that the war against them would ‘end in your lands’. Further in the clip, the boy calls the President a ‘puppet of the Jews’. I don’t know what this kid is supposed to do, but striking fear into the hearts of everyone that views this video, ain’t really the outcome. Not by a long shot. 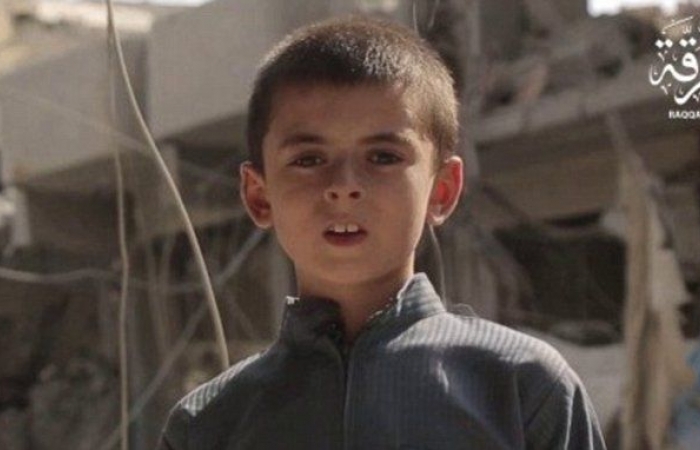 The video is believed to have been shot in Raqqa, Syria. According to information obtained, the boy’s name is Yusuf and it is believed that he and his mother had immigrated to Syria. In the video, he goes into detail on the constant airstrikes against the Islamic State and makes threats that the battle will be moved to and fought in the west. In another video, ISIS fanatics praised the perpetrators of the Barcelona attacks and said the fight against Spain would continue ‘to the end of the world’. ISIS and any other terrorist groups that believe that they can use children to intimidate the west are beyond stupid and really, just plain pathetic. What we see is psychopaths using small children – victims – to do their dirty work. What sort of effect is it supposed to have on the us? Really. Is this supposed to scare us? I don’t know about you, but the rest of ISIS needs to be slaughtered and buried with pigs. End of story.